with an open invite for the community to join us. It was the original idea of local entrepreneur Luke Colvin, who was seeking a way to have a bigger impact in the community beyond his successful service based arbor business. One of his clients from Seaside had a substantial home brewery in his garage and had been perfecting his favorite Lagers for over 40 years. After enjoying the recipes that our founding brewer Dan Hamilton was able to craft, Luke began tossing around the ambitious thought of opening a brewery. Luke bounced the idea around to Dan, his brother-in-law David Kroening, his long time friend and business advisor Jerry Kasinger, and also to local businessman Andrew Bornstein, who suggested his family’s 90+ year old cannery building as a potential site for the venture. The building was old, and in such a state of disrepair that he doubted it would be feasible, but the uniqueness, the history, and the views couldn’t be beat. That formed the founding team and location for Buoy Beer. Next up was working with everyone from friends and family to fisherman and local businessmen to raise funding and make this idea a reality. Like many of the investors, Luke had a long time relationship with our chefs, Eric Jenkins and Jennifer Chapman, through their mutual work with Clatsop Community Action (the local food bank) as well as many memorable catered meals. The team also needed an experienced professional brewer to complement Dan’s talents, and we couldn’t have found a better fit when Kevin Shaw came to join the team from Portland as our Head Brewer; and lucky for us, his new wife Katie also joined the team and manages the taproom. Buoy Beer was rounded out by talented friendly people like Wally, Kirk, Robin and the rest of our brewery and restaurant staff. Together we spend our days (and nights) making damn good beer, great food, and working hard to create a tremendous space and culture for our community to enjoy with us. And we’re proud of that. 1805 – Lewis & Clark make it to Fort Clatsop. 1811 – John Jacob Astor establishes Fort Astoria. 1922 – Fire destroyed Owen-Peeke Feed and Grain Company’s building on 11th Street in Astoria. 1924 – Owen-Peeke constructed the west portion of the current building for $5,500 as a feed and grain warehouse. 1928 – Burke Packing was destroyed by the 1928 fire that left a vacant space to the east of Owen Peeke’s building. 1933 – Prohibition was repealed. 1939 – New England Fish Company of Oregon (NEFCO) bought the building for fish processing. 1942 – NEFCO built the large east addition on the remaining wharf space between 7th & 8th street left vacant by the 1928 fire. 1955 – NEFCO closed the plant and the building was then used by Northwest Fur Breeders for the production of mink feed. 1981 – The music group the Beastie Boys was formed. 1982 – Bornstein Seafoods purchased the building and processed fish there until moving to a new facility in Astoria in 2006. 1997 – Dolly the Sheep was cloned. 2011 – Luke drinks some of Dan’s beer in his garage brewery. 2013 – Buoy Beer Company is established in May and brews its first beer in December on the pilot 3-BBL system, a Helles Lager. 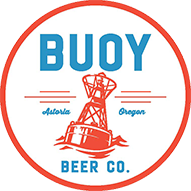 2014 – Buoy Beer opens its doors to the public on Valentine’s Day after a long wait for its 60 day lagers to be ready, and brews its first beer on the main 20 BBL system in April, a NW Red.